Cloves and their essential aromatic oil have immense health benefits and therapeutic values. The binomial name of clove tree is Syzygium aromaticum (L.) Merrill & Perry and its synonyms are Eugenia aromatica (L.) Baill and Eugenia caryophyllata. Syzygium aromaticum tree is a native of Maluku islands in Indonesia belonging to order Myrtales and family Myrtaceae. They are now primarily cultivated in Southeastern Asia (Indonesia, India, Pakistan and Sri Lanka) and East Africa (Zanzibar, Tanzania and Madagascar). Cloves are actually dried flower buds of Syzygium aromaticum and are used in cuisines all over the world. These unopened flower buds of Syzygium aromaticum with many health benefits, have long calyx bearing four sepals and a small ball of unopened petals. They are harvested when they are about one cm. long and are ripe red in color. Syzygium aromaticum trees are probagated by seeds having very short viability and are to be planted soon after the ripening of the fruit. Indonesia is the leading grower of Syzygium aromaticum cloves and much of the produce is used domestically. Much of the Syzygium aromaticum clove production in Indonesia is used in "kreteks", very popular aroma cigarettes. Bulk of Indian use of cloves is in their cuisine and in their traditional systems of health care and medicines. As they are dried buds, they can be stored and used through out the year. The active components having health benefits are in its clove oil, which is nearly 15% of weight of the dried flower buds. Eugenol is an aromatic compound present in the oil giving cloves their very strong aroma and spicy taste. Eugenol constitutes nearly 80% of the oil. Eugenol acetate (10%) beta-caryophyllene (5%) and triterpene oleanolic acid are the other chemical components present in clove oil. The oil of Syzygium aromaticum is highly potent irritant and should be diluted with other vegetable oils before therapetic use. The cloves of Syzygium aromaticum also have health benefits of containing minerals like potassium, manganese, iron and selenium. Presence of vitamin A, vitamin K, vitamin B6 (pyridoxine), vitamin B 1 (thiamin), riboflavin and vitamin C add to its immense health benefits. Antiseptic, antibacterial, anti-fungal and antiviral health benefits of Syzygium aromaticum cloves. Bacteria: Eugenol, the main constituent of Syzygium aromaticum oil, exhibits broad spectrum antibacterial activities against Gram-positive, Gram-negative and acid-fast bacteria. Virus: Tellimagrandin II, an ellagitannin, found in Syzygium aromaticum flower buds is found to show anti-herpesvirus properties. Eugeniin, a new ellagitannin isolated from cloves, is found to have anti-herpesvirus properties. Fungus: Eugénia Pinto et al in their study "Antifungal activity of the clove essential oil from Syzygium aromaticum on Candida, Aspergillus and dermatophyte species" have found that clove essential oil, obtained from Syzygium aromaticum showed remarkable anti-fungal and inhibitory activity against all tested strains of Candida, Aspergillus, clinical dermatophytes, fluconazole-resistant strains and American Type Culture Collection strains. Considering the benefits of Syzygium aromaticum, in many dental products cloves are being included. The use of cloves in relieving toothache is a well known home remedy. When a bud of clove is pressed on the site of pain, there is relief due to its numbing local-anesthetic effect. Further its antimicrobial and antinflammatory activity reduces the infection and related inflammation in the tooth. 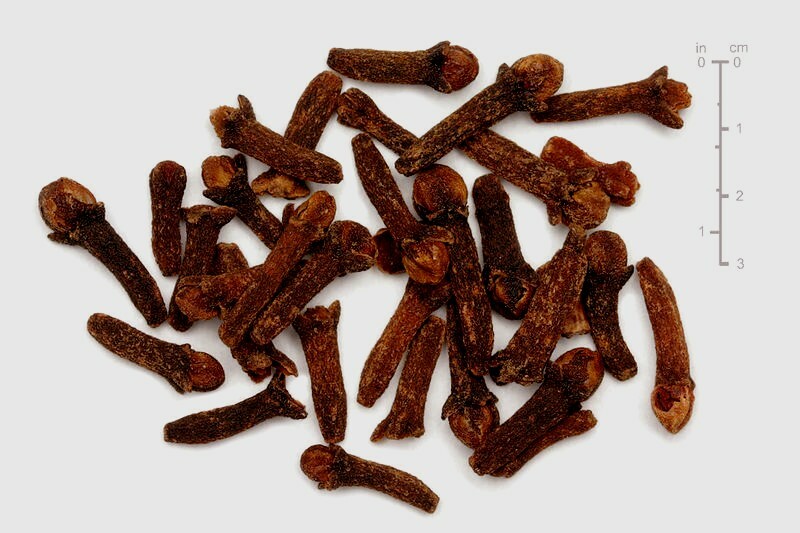 Chewing a clove gives the health benefits of bad breath control and reduction of microbial load in the mouth. Nangle MR, Gibson TM, Cotter MA and Cameron NE in their study "Effects of eugenol on nerve and vascular dysfunction in streptozotocin-diabetic rats." (Planta Med. 2006 May;72(6):494-500.) found that 'aspects of both vascular and neural complications in experimental diabetes are improved by eugenol, which could have potential therapeutic implications for diabetic neuropathy and vasculopathy'. Aspirin health benefits for colorectal cancer. MRI uses, benefits and health risks. Health benefits of cloves (Syzygium aromaticum or Eugenia aromatica). 1. Eugénia Pinto, Luís Vale-Silva, Carlos Cavaleiro and Lígia Salgueiro. Antifungal activity of the clove essential oil from Syzygium aromaticum on Candida, Aspergillus and dermatophyte species. Journal of Medical Microbiology. J Med Microbiol November 2009 vol. 58 no. 11 1454-1462. Amit sankar Dutta. Journal of Pharmacognosy and Phytochemistry. Vol. 1 No. 1 2012. Recent Trends in Indian Traditional Herbs Syzygium Aromaticum (cloves) and its Health Benefits.